Walmart released their Black Friday ad yesterday, and there are lots of deals to be had! This year there will be 3 different “event” start times. Event 1 starts at 6PM on Thanksgiving Day (Thursday, 11/28/13), Event 2 starts at 8PM Thursday and Event 3 starts on Friday, 11/29/13 at 8AM. Some items are guaranteed to be in stock for 1 hour which is awesome, because if it isn’t there within that hour you will receive a Guarantee Card that ensures the item will be shipped to your home before Christmas Day. Here are some highlights from the Walmart Black Friday Ad. Please note that Walmart’s Christmas Ad Price Match Policy does not apply to Black Friday Deals. 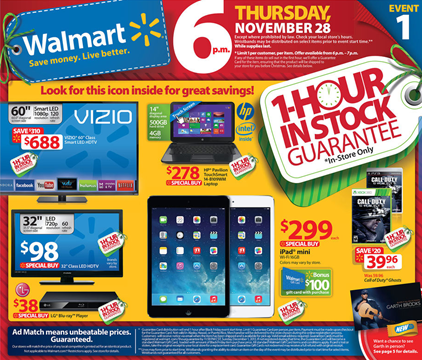 View the complete 2013 Walmart Black Friday Ad Scan here. Next post: Furby Boom Figure for $40 Shipped!! !